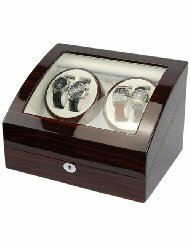 Watch winders are available to store automatic watches and keep them wound for people who do not wear their automatic watches every day. This is particularly advantageous where a watch has complications, such as perpetual calendars or moon phases. A watch winder can hold one or more watches and move them in circular patterns to approximate to the human movement which otherwise keeps the self-winding mechanism working. Older mechanical watches should be wound and running as much as possible to prevent their lubricants from congealing over time, diminishing accuracy. Modern mechanical watches generally use synthetic oil; whether or not synthetic oils congeal is a point of contention among watch experts.